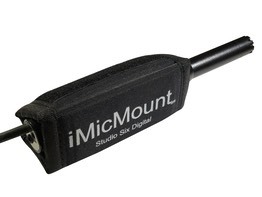 Attach iTestMic, iPrecisionMic, or any 3/4" diameter microphone securely to your iPhone, iPod touch, iPad, or other smartphone with iMicMount. 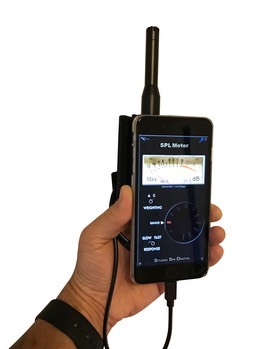 iMicMount is specifically designed to attach iTestMic to your iPhone to create a mobile sound level meter and acoustic measurement device that you can hold in one hand. iMicMount uses high-strength Velcro to attach to any iPhone case, making a secure connection so that you can hold the iPhone and iTestMic in one hand while you use it. The microphone is securely held, since the inside of iMicMount has neoprene rubber pads to grip the mic and cushion it from vibration and handling noise. 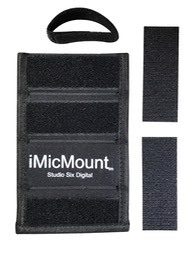 iMicMount also includes a Velcro cable tie, so that you can take up excess cable neatly and securely. Installation is very simple. Just attach one of the adhesive Velcro strips to your iPhone or iPad case, fold iMicMount into a triangle, and press it onto the case. Now slide the microphone in and you are ready to go! Use the Velcro loop to hold the cable so that you don't have the cable dangling loose. Check with your distributor for pricing and stock.